As I write this, we’re on the cusp of the fiftieth anniversary of the Beatles’ arrival in New York City and their first appearance on the Ed Sullivan show. Published by The Daily Beast and released this week, Michael Tomasky’s Yeah! Yeah! Yeah! looks back at those events in February 1964, how and why they happened, and what they meant for the years to come in a very engaging way. Tomasky looks at the Beatles’ arrival through a cultural history lens. The cultural history perspective on the Beatles has been covered before, in works like Ian MacDonald’s Revolution in the Head (still my favorite go-to volume of Beatles scholarship) and Tim Riley’s Tell My Why, but these books cover the entirely of the Beatles’ careers from a British perspective. Tomasky’s book complements those works, as he offers an American perspective on the Beatles and their moment. He sets the groundwork by looking at where the United States was politically, socially, and musically in the 1950s and early 1960s, and then he shows how the Beatles, the product of post-war Liverpool, were completely unlike anything America had ever seen or heard. The accents, the clothes, the hair — all outside of the norm. The music with its harmonies, strange chords, and even stranger sound — totally unlike anything on the charts. The Beatles were the right cultural force at the right cultural moment when they could have the maximum effect, and Tomasky shows how these all came together in a way that will never be repeated. Yeah! Yeah! Yeah! isn’t an academic book on the Beatles. Rather, it feels like a conversation with a close friend who has a lot of things — thoughtful things — to say on the subject of the Beatles and he’s going to say them on your level. It’s written very much as a piece for 2014’s audience; as an example, to explain 1950s and 1960s culture, Tomasky draws analogies to Fox News and the Tea Party. He talks about how different our experience with music is today compared to a half-century ago, and that tracks with how different people’s expectations out of life were different then. (Noteworthy here is Tomasky’s account of Jeanine Deckers, the Singing Nun.) I’ve been reading Tomasky’s work for the better part of fifteen years, from the American Prospect to the Guardian and now the Daily Beast, and he has a very engaging, very easy-to-read prose style. If this week makes you at all curious about what happened in 1964 and how the Beatles became the biggest British thing in the United States since the burning of Washington and the Battle of New Orleans, Michael Tomasky’s Yeah! Yeah! Yeah! is a very good place to start. He scrubs away the barnacles of fifty years of Received Widsom on the subject, he gives you the cultural history of the time so that you can understand the moment, and he tells you what you need to know about the music and why it worked. 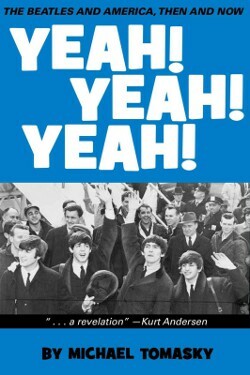 Whether you’re a casual fan or a committed Beatles scholar, Yeah! Yeah! Yeah! is a rewarding addition to your library. My Readmill annotations on the book. Next Next post: Baseball Field, Oh Baseball Field!